When an incandescent light bulb burns out, the proper disposal procedure is to throw it away for standard household trash collection. Simple enough. But this is exactly the wrong way to handle a compact fluorescent lamp (CFL) when it burns out. And incorrect disposal is more serious than you think. Like commercial fluorescent tubes, CFLs contain mercury, and mercury has no place in our landfills. Most spent commercial fluorescent lamps used in business are carefully controlled and recycled by law under the EPA's Universal Waste Rule, but there has been a serious lack of information when it comes to advice on residential CFLs. Because they look a bit like standard light bulbs, many homeowners treat them the same way, throwing them away rather than recycling them. Why all the fuss? CFLs contain about 5 milligrams mercury, a neurotoxin. MSNBC reports that data interpolated from Stanford University research shows the amount of mercury in one CFL "is enough to contaminate up to 6,000 gallons of water beyond safe drinking levels." An EPA-funded study found that one gram of mercury deposited in a 20-acre lake is enough to contaminate the fish and make them unfit to eat. The reason mercury is so dangerous to humans, wildlife, and the environment is that mercury is toxic in many forms and can easily transfer from air to soil and to water. Mercury also bioaccumulates in living organisms and increases in toxicity levels as it moves up the food chain. The recycling industry estimates that in 2007 about 400 million CFLs were purchased in the USA but only 2% were recycled. That's 320 million CFLs in the trash. Irresponsibly adding billions of spent and broken CFLs to our landfills is a looming environmental problem of epic proportions. If CFLs are to be used, they need to be handled properly through their entire life cycle, including disposal. A CFL can release mercury vapor when broken--a problem outside the home and even more toxic in the home. That's why the EPA has a 12-step remediation plan that includes evacuating the room and opening the windows when a CFL breaks in your house. 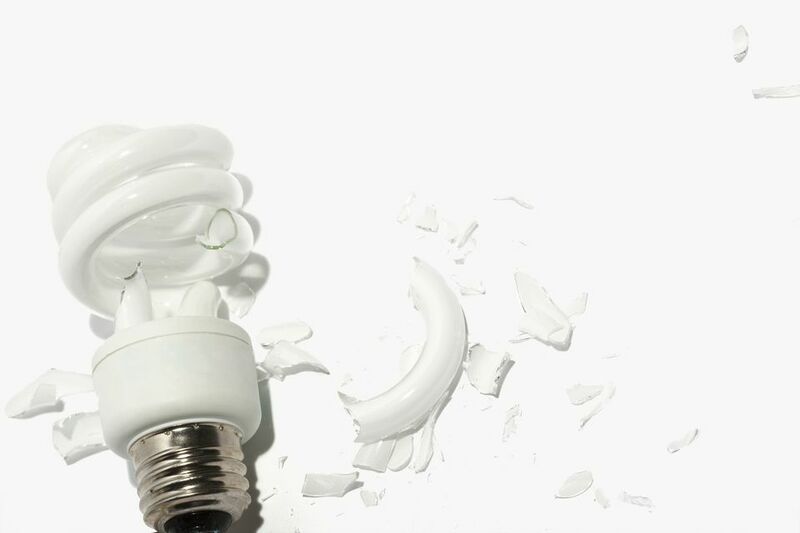 Of course, CFLs that make their way to the landfill are a major problem, too. The Northeast Waste Management Officials' Association (NEWMOA) has an informative article on mercury emissions from municipal landfills. This states that "Mercury is a potent neurotoxin that can affect the brain, liver, ​and kidneys, and cause developmental disorders in children. Young children and developing fetuses are especially at risk." Mercury losses occur at the working face of the landfill and landfill gas vents. Landfills are a major source of the more toxic, organic mercury called methylated mercury. Mercury is also lost before it reaches the landfill. Fluorescent bulbs are significant sources of mercury emissions. Whether your state mandates recycling or not, do it! Since we're using CFLs to reduce electricity use and help the environment, it really makes no sense to turn around and pollute out waste stream with them. Why Did My CFL Burn Out So Fast? Get used to frequent recycling. One of the biggest myths in all the CFL hype is the rated life of the bulb. You don't have to look far to find the same misleading claim that you will get 6,000 or more hours of life from a CFL. Both consumer complaints and lab research are showing how untrue this is. Studies have proven what consumers have been discovering. CFLs rarely meet their rated life in real-world applications. Why? It's possible they have been used in the wrong application. But they also must be turned on continuously or at least for 4 hours at a time to meet their rated life. If they are on for only 1 hour, you get a 20% to 50% reduction in lamp life. If the CFL is used with 5- to 30-minute use cycles, like most incandescents, their life is reduced 70% to 85%. That means your 6,000-hour bulb is now lasting 900 hours, less than many incandescent bulbs. "CFL manufacturers recommend that you install and remove the CFLs by grasping the plastic portions of the base only. If the CFL is screwed into a light socket by twisting the tube rather than the plastic base, it can cause the vacuum seal or glass tubing in the CFL to break. Once certain parts are exposed to oxygen, they are more liable to become defective and/or overheat." So, do not twist a CFL by the glass, Grab it at the base to twist counter-clockwise to remove it. Store fluorescent light bulbs in containers that prevent them from breaking, such as in their original boxes, [plastic packaging], or boxes from replacement bulbs, or in containers supplied by fluorescent light bulb recyclers. Breaking these bulbs could result in the release of mercury. In addition, fluorescent light bulb recyclers generally require that the light bulbs arrive unbroken. Mark the lamp storage container as "Fluorescent Light Bulb for Recycling." Take lamps to a local household collection facility or arrange for a fluorescent light bulb recycler to pick them up. Home centers and other hardware retailers have special recycling bins for CFLs. Ask at your local stores. It's easy enough to keep your burned out bulbs in your garage and take them in the next time you need home improvement supplies. Otherwise, you can find a local recycling center that accepts fluorescent bulbs and tubes by searching on Earth911. Can You Recycle and Reuse Ceramic Tiles?